Just because we’re getting closer to the end of summer doesn’t mean you aren’t going to use the air conditioner for the rest of the season. There are still likely to be a few times when you’re going to need your air conditioner before it turns off for the rest of the season. For those times, it’s important that you keep an eye out for problems that might arise with the air conditioner. You don’t want to end the summer by paying high AC repair costs, after all. The following are a few of the more common problems you might run into during the next couple weeks. If you notice fluid dripping from your air conditioner, you might have a refrigerant leak. That’s a sign you need to call for repairs as soon as possible. Your air conditioner relies on refrigerant to siphon heat from inside your home and release it outside. The more the refrigerant level in the air conditioner drops, the less able to cool your home the system will become. If the refrigerant level is allowed to drop too low, the system could break down entirely. Have a technician check out your air conditioner if you notice any fluid dripping from it. A simple maintenance check can save you tons of money. Short cycling is when the air conditioner turns itself on and off more frequently than it should, typically due to an electrical issue. Turning off before the system has had a chance to complete a full cooling cycle will reduce its effectiveness when it comes to keeping your home comfortable. It will also increase the level of wear and tear the system accumulates over time. The longer a system is allowed to short cycle, the more prone it will be to developing problems. If the issue isn’t dealt with promptly, it can even shorten the overall lifespan of the system. This is why it is so important to call for repairs immediately if you notice that your system is short cycling. 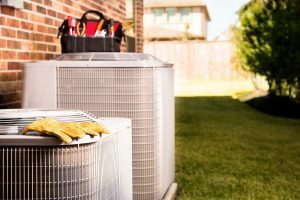 If your air conditioner seems to be operating just fine, except it isn’t blowing as much air as it normally does, then you might have an issue with the air filter. The air filter is the part of the air conditioner that is responsible for protecting the system from the various dust and dirt particles that are found in the ductwork. If the filter is not cleaned out often enough, it will become clogged and block most of the air from entering the air conditioner. Change your air filter every three months while using the AC regularly to prevent this problem. If you need help with your air conditioner, contact us today to schedule an appointment with one of our professional technicians. We’ll make sure that your air conditioner finishes out the season in good shape. Tuckers Air Conditioning Heating & Plumbing provides comprehensive air conditioning repair services throughout Germantown.